Every Saturday I come home with a beautiful zero waste farmers market haul. 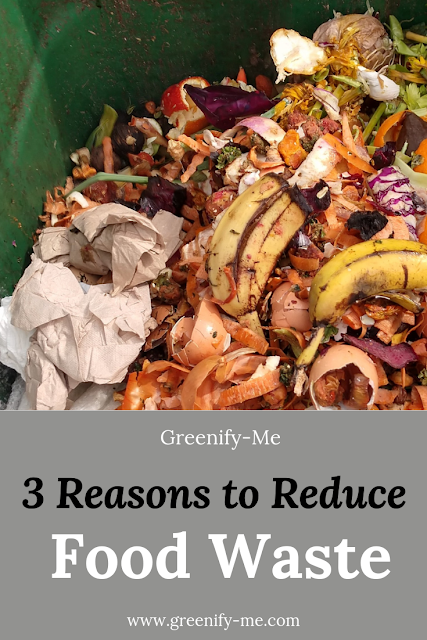 Reusable tote bags stuffed with mesh produce bags; Returnable paper cartons filled with delicious, local berries; Spinach and romaine lettuce with leaves the size of my hand. Fresh produce gives me so much life. Not only is it healthier for me, but it's healthier for the planet. There's very minimal packaging on these plants, if at all, at the market. I'm able to go there with produce bags a blazing and stuff 'em all in. No plastic single-use bags needed. And I do it every. single. Saturday. It feels so good knowing I have this beautiful bounty to look forward to. The earth produces some amazing things (especially in summer, at the peak of growing season) and it's fantastic to experience that first hand. Why wrap something as beautiful as lettuce the size of my head in a plastic bag? I don't think so. 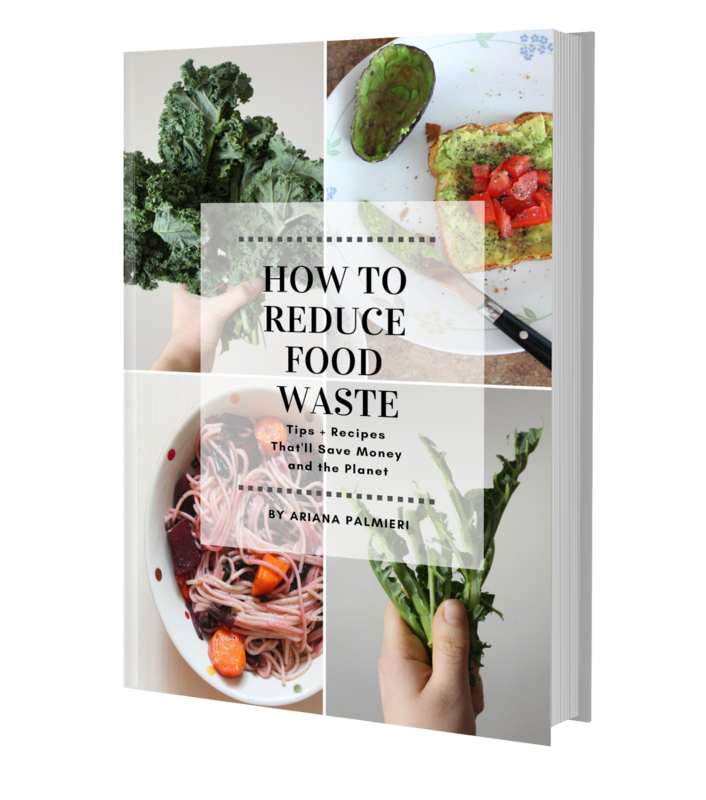 If you've been wanting to shop at the farmers market, or even just the grocery store, without producing waste, be prepared. I'm going to show you exactly what I use to get the job done. 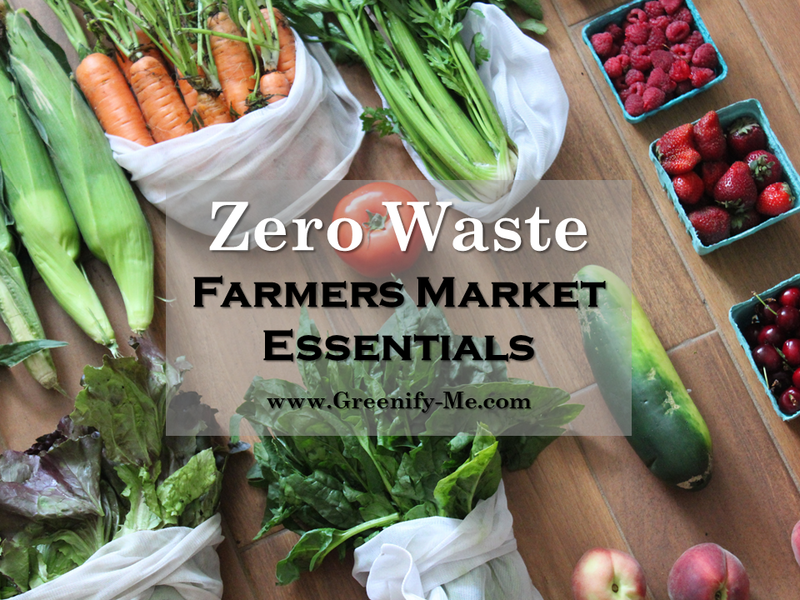 Here are my zero waste farmers market essentials. 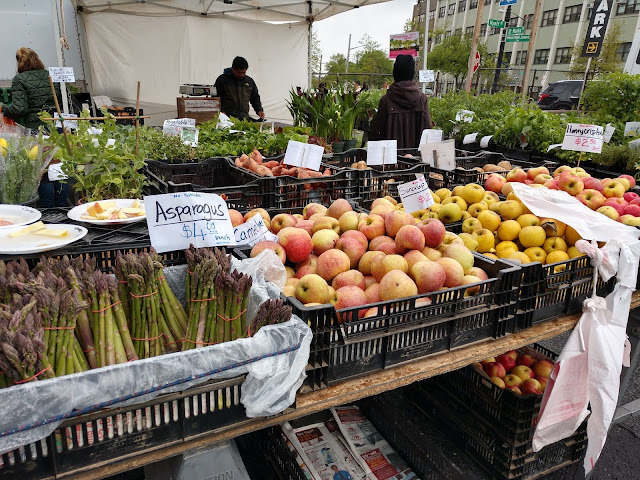 Do you have a farmers market near you? I highly recommend you check if you're not sure. Just a quick google search should help: "________ (state/town) farmers market" will suffice. Then, once you find one local to you, see what days and hours they have. Usually, in New York (which is where I'm based), farmers markets only operate on Saturdays and/or Sundays. Mine (in Staten Island) is open every Saturday from 8 AM to 3 PM, so that's when I go. Some markets are seasonal though, meaning they are only open from the spring to the beginning of winter. I have one that's open year round on the Island, but there's one I always go to in the spring, summer and fall that closes come winter. Everything you get there is locally grown and not treated with harmful pesticides. Local produce means it doesn't travel miles to get to you, sitting in transit for hours or even days. This greatly cuts down on carbon emissions, and means the food tastes noticeably fresher. It's easy to shop plastic-free there because you can easily use produce bags and tote bags to store your bounty. Everyone is just so happy there. The farmers are so proud of their own produce and love sharing how the food was grown (pesticide-free). Sometimes you even get to hear live music while shopping around. Plus, you can usually spot some cute doggies! It's the best. You can return any plastic or paper cartons your fruit comes in (my berries come in paper cartons I return every week). You can also return any rubber bands used to secure leafy greens so there's no waste. It's a great way to get whole, real, seasonal food on a budget. That said, if you can't find a farmers market near you, for whatever reason, you can use your local grocery store. Check and see if they have a fresh produce section where everything is package free. My local grocery store does as soon as you walk in. A lot of the fruits and vegetables tend to have produce stickers on them, which cannot be recycled or composted, but the leafy greens usually don't (those tend to have those plastic ties around them though). Okay, moving on to the most important part: Zero waste farmers market essentials. In order to produce as minimal waste as possible, I highly recommend investing in these essentials. They're what I use (and love) every time I go to the market. Reusable produce bags: I tend to use a mix of cotton and synthetic produce bags while at the market. I love both equally, but the cotton ones can biodegrade at the end of their life. You just plop everything you could ever want into them and boom, done. Both my cotton and synthetic produce bags can hold a lot of weight (I've put everything from a bushel of apples to huge romaine heads in there). Sometimes, in place of a reusable produce bag, I'll use a Swag Produce Bag. These work just as well and help keep my produce fresh all week long. I tend to bring at least 8 or 9 produce bags with me to the market every week, but honestly, you can never have enough! Both the cotton and synthetic produce bags are machine or hand washable too, which is quite handy. Tote bags: I usually bring at least two or three tote bags with me to store all the fresh produce. After putting the produce into the produce bags, they need a place to chill out. Tote bags are so cute and you can just sling it over your shoulder, easy peasy. Canvas tote bags are the best because you can easily wash them and they're compostable at the end of their life. Beeswrap: If you plan on buying cheese or bread (especially a baguette), it may be a good idea to take some beeswax wraps with you. You can request they put it in your beeswax wrap instead of wrapping it in plastic or paper. Just ask and hand them the beeswax wrap. If you're confident, they won't even second guess it. Glass jars: You could put berries into a produce bag, but they will probably stain everything. Instead, bring a latch top jar or mason jars with you for berries. These will secure the berries in place and prevent them from being squished when you place them into your tote bag. If your farmers market sells the berries in paper cartons, you can just take them in these (no jar needed) and bring them back next week. The farmers always appreciate this as it saves them money in the long run. Stainless steel tiffin: If you love getting treats at the farmers market (ahem, guilty as charged), you should definitely bring a metal tiffin with you. There's a bread stand that sells these amazing cranberry walnut muffins I go crazy over in the winter. I must have them. I ask them to put it into my metal tiffin and all is well with the world again. Life is good (and waste free). Every weekend I head to my market using all my zero waste essentials. I come back with beautiful hauls! 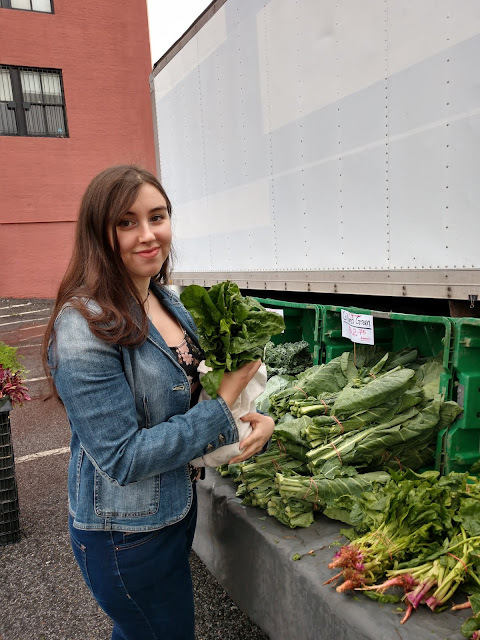 Here's what my zero waste farmers market hauls tend to consist of according to the seasons. In the winter, we tend to eat more bread than any other season. Also, can you spot my metal tiffin with the cranberry walnut muffin in it? Ugh, so good. We get a lot of kale, collard greens and potatoes in the winter (though only the kale is pictured). We also get carrots, mushrooms and the occasional beets and turnips. I put them all in my produce bags. And, of course, we get eggs (we return the paper carton). As spring starts to roll in, more and more produce starts becoming available. Finally, fresh lettuce appears! Along with spinach and arugula. Sometimes, we get dandelion greens too and it makes for a great, detoxifying salad. Yay for leafy greens! We put it all into our produce bags. Strawberries finally come into play and I get so excited. They are my favorite fruits and I can only eat them in spring and summer, so I jump at the chance to buy them at the market. We usually get them in paper cartons which we return every week. Tomatoes and asparagus start to appear too. Asparagus doesn't stick around too long, but I always get it while it's around. I love my veggies! Summer. My favorite season, ever. I love how much produce is available! We get everything under the sun from corn to peaches to raspberries to swiss chard. You name it, we get it. And it feels so good! We return the rubber bands that come with them every week. I love seeing the abundance of fruit after a winter of apples. We get so excited to bring home cherries, raspberries, blueberries, strawberries, and peaches. Depending on what we want to make, we also buy accordingly. We like using celery in soups, so we'll occasionally buy that. Carrots are great in soups and salads so that's a constant. Cucumber, lettuce, spinach, string beans and tomatoes are always givens. And corn. Lots of corn. Come fall, we love getting tons of broccoli, chard, celery, carrots, apples and any remaining summer produce! The summer produce tends to linger for a bit so we can still grab some amazing favorites like strawberries, tomatoes, cucumbers, lettuce, and green beans. We'll also grab squash, pumpkins and gourds from time to time. My mom makes an amazing pumpkin pie from her personal favorite pumpkin: Cheese pumpkins! Later in the fall, we tend to get a lot of brussels sprouts, cauliflower and sweet potatoes too. Each season is loaded with abundance and interesting foods. It really makes me appreciate my food more. I can't get fresh tomatoes or strawberries in the winter or fall, that's for sure (and that's okay). Living in tune with the seasons is the best thing, and it's really helped me avoid plastic too (the strawberries at the grocery store are always packed in plastic). So friends, my challenge to you? 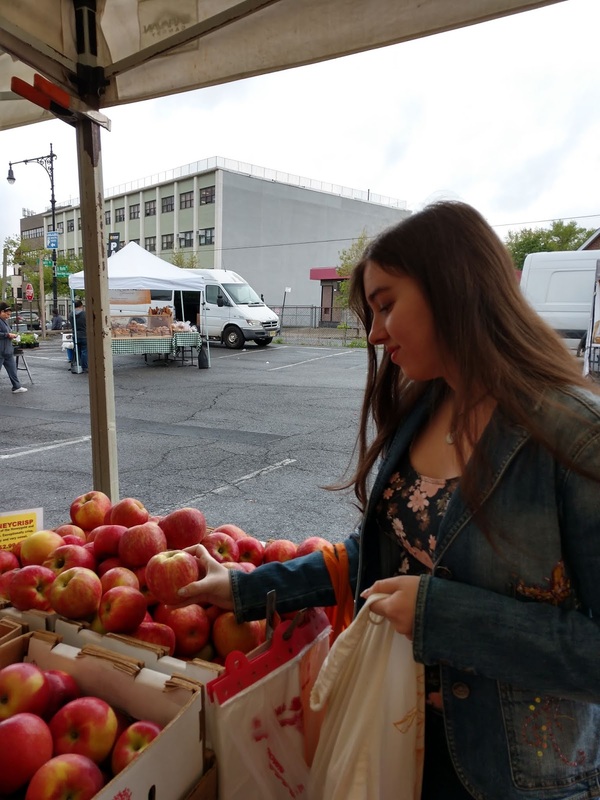 Shop at the farmers market for all your fresh produce. Live with the seasons. Buy your produce package and plastic free. You won't be sorry. 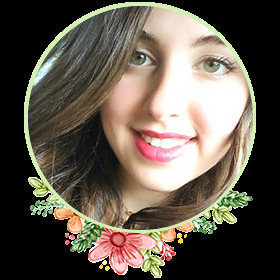 Are you looking for in this regard, it is enough to read this post, sensationally you approach to thesubject.Great stuff, it's important that all of this as well have described, a revelation!Thank you for the information you wrote.